APPLETON (WLUK) -- You want to beat Fox Valley Lutheran? Then tackle this guy, Zayne Rodencal. 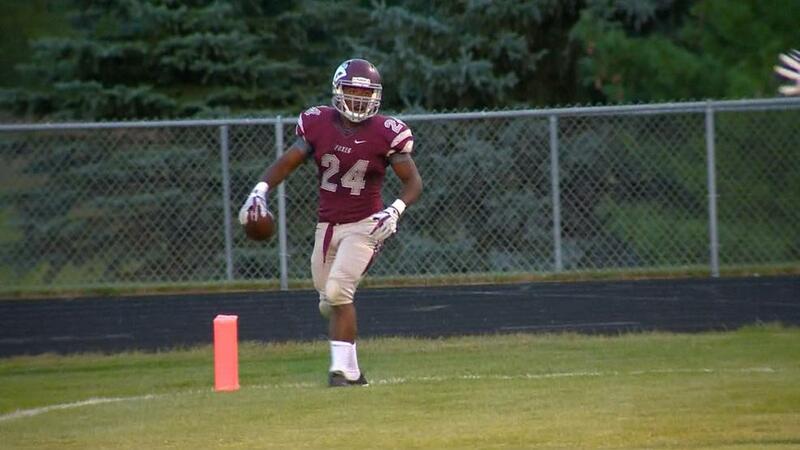 The running back is shredding defenses this season and is a big reason why Fox Valley Lutheran is undefeated. Rodencal has rushed for at least 135 yards in each game this season, with a season-high 371 yards against Luxemburg-Casco. He's averaging 222 yards per game and is second in the state with 888 yards. Friday night Wrightstown plays at Fox Valley Lutheran and Tigers coach Steve Klister knows what his defense is up against. "Zayne is one of those special backs that comes around once in a coach's career," Klister said. "He's powerful and yet he's shifty enough that he can make people miss, but run through tackles. And he also has the speed to run away from people." Rodencal (5-10, 205 pounds) is drawing college interest from Northern Illinois, Morehead State and Minnesota-Duluth, amongst others. He says these are his top three right now. Like any star running back, he doesn't claim he's chewed up four defenses to-date by himself. "I can't take all the credit, because I need my lineman and receivers blocking out there," Rodencal said. "Really, I can only do so much. I need them out there to make the blocks for me so I can make the cut." Listen to his coach, Adam Frey, talk about him and you come to the conclusion Rodencal has an in-Zayne makeup for a running back. "He's a weight-room warrior," Frey said. "He's a super strong kid. He's just so quick. "He's not necessarily super speedy straight ahead but he can make people miss; but he has the power, too. He can put his shoulder down and give a stiff arm and his vision, especially, is what makes him so good." Rodencal has been seen on a regular basis make the FOX 11 Game Time highlights show on Fridays as he has scored 11 touchdowns this season. He likes finding the end zone. "It's feels great," he said. "When I'm running I'm really just saying, 'Just keep going, get to that pylon and hand the ball to the ref after you score.' Just keep on chugging and don't ever stop." As long as Rodencal keeps going, FVL will keep going.